1) How did the two of you come together to create this collaboration? K: This collaboration was a process of getting to know one another. Despite living just across the bay (in Oakland and San Francisco) for several years and both being active in the Bay Area improvised music community, we first met one another on a simultaneous visit to Japan. After that, we did a collaborative performance back in San Francisco around Gretchen’s project using postcards as visual scores and in collaboration with dancer Peiling Kao (early in 2015). We felt the sonic chemistry, so we pushed it further with a performance in Kyoto on a subsequent trip to Japan. When we were both home again, we began meeting regularly back in the Bay Area and recording our sessions. I have been part of a collective putting on concerts in this abandoned munitions magazine on a decommissioned naval base at the northeast end of the bay for a few years and thought our percussion and voice duo would sound amazing in that resonant space, so we spent a day recording there. Then we started thinking it would be interesting to combine the recordings of improvisations done in those very different acoustic spaces. 2) Was the process of creating together difficult or did it seem to come naturally? I feel like having two people creating together is the toughest way to go because if you both disagree on something there is no third person to be the deciding vote. K: It really feels natural, which is remarkable considering we hadn’t heard one another very much before working together. Of course, the natural connection gets cultivated into something more familiar the more we collaborate. We have now worked in various contexts from duo to trio and larger improvised ensembles to more structured works for dance, which Gretchen composed. In each of these contexts there hasn’t been an issue of disagreement but rather lots of communication about how to approach certain projects and also an openness to arranging things in various ways. I think there is a natural sense of trust and co-authorship in our practice, which keeps it evolving. G: For whatever reason, we see eye to eye on a lot of things relating to music, and even if we don’t, our ability to communicate verbally as well as musically seems to bridge any gaps that might appear. Maybe some people work well with conflict, or with someone to push against, but Kevin and I so far haven’t run up against that aspect of our relationship. 3) What was the idea behind having "hirakito" as one long piece instead of breaking it into individual songs? G: My first reaction is to say—there aren’t really any ‘songs’ on this CD per se—assuming that by ‘song’ you mean something with words and a fixed, repeatable melody. All the segments on hirakito were extracted from longer recorded takes, and all of those takes were documentation of free improvisations. Our logic in selecting the segments was first, to favor excerpting portions that seemed to have a natural beginning and ending. And especially in the Mare Island recordings, the natural resonance of the space makes it challenging to cut off without it being obvious. Thus our second guiding logic, which was to contrast the qualities of the spaces we recorded in. People’s ears are so accustomed to the super-unnatural artifice of recording studios—and in ‘live’ settings, the ever-increasing super-loudness of PA systems—we wanted to highlight that. It was one of the main things we talked about when we decided to make hirakito. K: The way we assembled this project from multiple improvisations in different locations including playing environmental recordings from distant places into the space while improvising with those sounds felt to me like mapping a sonic territory which folds back in on itself in a fluid way. So in these terms I did not want to create divisions like borders between those locations but to allow them to flow continuously. For me, there is a bit of surrealism at play here, which would be lost if site transitions were fragmented into separate songs. 4) Do you think this collaboration could lead to more crossovers in the future, such as Kevin on a glou glou song or either of you working with Dire Wolves? K & G: Funny you should mention these two projects that include Arjun Mendiratta, since in fall of 2017 the three of us spent a day recording an all-acoustic, open-air session (with him on violin) up on a ridge in the mountains over Half Moon Bay where Arjun was living. K: Something I love about improvisation is the readiness to combine our sounds with other musicians or artists working in other areas like dance and film so I'm sure this duo can continue to expand into other contexts. 5) What are your thoughts on cassettes and physical media for music in general? 78s). I used to have more CDs and a huge mixtape collection, but a bunch got ripped off when I shipped them from Japan while moving back to the US some years ago. I still feel pangs of regret and anger about that loss, since the mixtapes were personally meaningful (some made by friends who are gone from this world) and some of the CDs are irreplaceable (including a whole bunch of gamelan recordings I collected in Bali). Of course I appreciate digital/streaming media (I’m still using my first mp3 player, an iPod mini from 2006).... but there’s something about people’s ways of making music into physical objects that fascinates me. K: I like cassettes a lot. As a kid I had this boombox with an external microphone that I'd record random things on. I later got into microcassette recorders for more portable sound collecting. As a teenager mixtapes were very important to me, both making and receiving them. So I'm happy tapes are still being published by many labels and artists independently. I still buy CDs and records, too. It's a personal preference to engage with physical media when listening to music. 6) What is it like working with Full Spectrum? K: It is so great that they are supportive of this project. Andrew and Gretchen K have been great to work with. Communication is important to me and they have been communicative throughout the whole process. I can see they have a very clear and efficient vision for their label and I admire that. G: Yes, they’re the best! Andrew is so open and positive, yet very organized and incisive, and Gretchen K. has a special knack for creating unique imagery for each musical project that matches in unexpected ways (just compare the two glou glou releases to this one). Full Spectrum are totally dedicated to music, grounded yet free, and with a certain commitment to dreams and ideals that I totally synch with. I’m only bummed that we now live so far apart! 7) Is there anyone else that either of you would like to specifically work with? G: Hmmmm.... there are so many musicians whose working process I respect and whose work I adore... But the chemistry of working with someone is hard to know in advance. I always look forward to finding a new collaborative ‘someone’—and of course, to continue maintaining the musical connections that have proven so fruitful and engaging in the past. K: I work with lots of people and hope to continue doing so. Something I love about improvisation, as hinted at earlier, is the fluidity of collaboration and openness to risk taking in performance. I always look forward to visiting new places (or revisiting places) and collaborating with others especially when it offers an opportunity to connect with people from different places and transcend cultural differences. This kind of collaboration is extremely meaningful to me. 8) For me, growing up, it always felt like the person you didn't want to be in a band was the drummer and now artists are making albums and performing live solely with percussion. 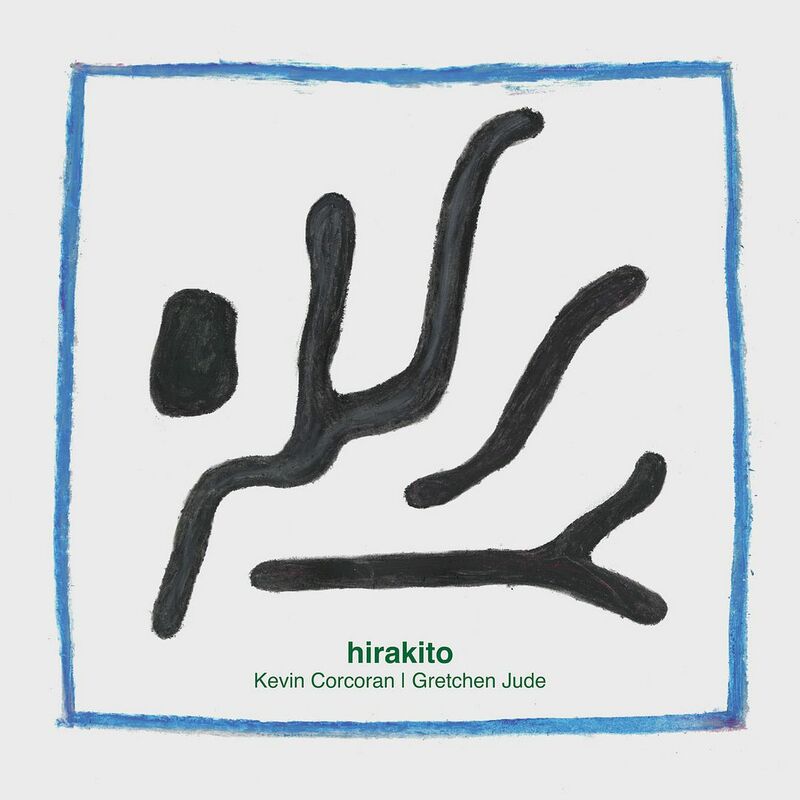 With "hirakito" being a work of percussion and vocals, do you feel that percussion has finally found its own voice? K: If you think about percussion as any sound created by objects coming into contact it is an incredibly broad field of sonic possibility we are dealing with. This speaks to the extended technique approach and the quest for ever more sonic potential from all sorts of percussive instruments. On a more humble level, percussion is one of the earliest musical instruments and so also speaks to a primitive kind of music making that is deeply human and probably all of us can relate to. So for me I don't think percussion has "finally found a voice" but is in a continuous process of voicing its multiple manifestations through both found and forced instances in the world. G: I hope that folks might notice the places in these recordings where the voice IS percussive (as well as where the percussion not at all ‘percussive’ but rather sustained and very tonal). I love finding those places of sonic crossover and playing there to highlight the ambiguities. 9) If you could pick a name for your duo, what would you have wanted to have called it? K: Ah! This was quite a discussion whether to find a name for our duo or keep with our given names. If I remember correctly, the title of the album came from earlier discussions about naming the project. G: Yeah, we just couldn’t pick a mutually satisfactory ‘band name’ so we were fine with just using our names in alphabetical order. G & K: First shout out to Peiling Kao, Masafumi Ezaki, Bryan Day, and Matt Davignon for giving early support to this project and providing it space/attention in different ways to do its thing. Also shout outs to Andrew and Gretchen at Full Spectrum (of course), to Jacob Felix Heule for mastering the recording and being super supportive of improvisation in the Bay Area in general, to you for encouraging this conversation, and to anyone who takes time to listen to our sounds in this hectic, sound-saturated world.